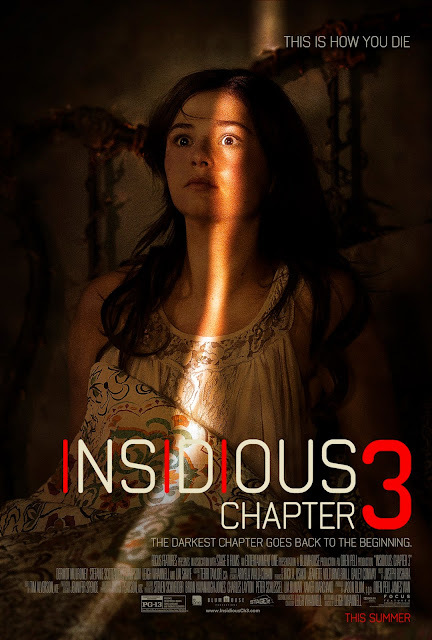 Chrichton's World: Review Insidious: Chapter 3: Good enough but not on par with the previous two. Review Insidious: Chapter 3: Good enough but not on par with the previous two. Something unpleasant or dangerous gradually and secretly causing harm. This certainly was the case in the original Insidious, much lesser so in Chapter 2 and in Chapter 3 it was present at times but nowhere near compelling or frightening. Although I was expecting a whole lot worse. In this third part they do take it a notch down from Chapter two. Which was a wise decision as that one had almost become a parody of the original. However some mistakes of the second part did sneak into this third one. Like the sound. Long before something happens you hear the eerie music playing. Sure it is effective a few times but overall it made you prepared of what was to come completely taking away the fright. In some scenes they do it right for a few seconds to then switch to the loud music again. The scenes done right are filled with tension because they are quiet. You have no idea where to look at and no matter if you are aware something is going to happen it freaks you out. Because this is the time where your own imagination is running wild and you secretly are hoping to be scared immensely. But like I said most scenes are the loud ones and it takes you away from the terrifying viewing experience you should have. Chapter 3 though does manage to keep some sort of tension since it very rarely goes over the top. The minimalistic approach works in favour of the few thrills this film provides. Now I do have to admit that at times some of the scenes did make me laugh where it was clear the scene was meant to be scary or dramatic. I think that must be the curse that most sequels or prequels suffer from. You already seen this before and nothing new or fresh has been added. So you basically can predict of how it will end. Saving grace is Lin Shaye who plays Elise Rainier. She will bring a smile to your face. Overall Insidious Chapter 3 is good enough but it is not on par with the previous two. For that it is too lacking in the creepy and scary department. There are enough moments where you will jump up but never will you feel dread like in the original one. Which is a shame of course but still it could have been far worse. And I have to say despite this one not living up to my expectations I still enjoyed myself. Not one I would recommend but if you happen to catch it it's not a waste of time.